This weekend felt short, not long at all. I need another day! I tackled Stella's closet and we started painting her bathroom so we're wrapping up the weekend exhausted, not relaxed. And yet, we had a lot of downtime, too. We went swimming, grilled steaks, and attended a precious block party in our neighborhood and got to know more friendly faces. 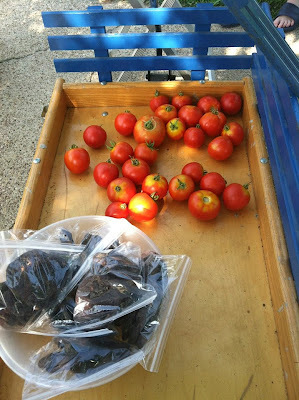 Nick had a tomato sale so we bought a pound from him as well as his cookies and took a tour of his garden. He has quite the operation! I think if anything happened this weekend, it was that our love for our tiny, very unassuming neighborhood grew in leaps and bounds. i love blue & white ticking stripe. coral peonies. raspberry tarts. monograms. iced coffee. inside jokes. dinner parties. gas-lit lanterns. tartine in san francisco. ideas on napkins. fried okra. francesco clemente. striped beach umbrellas. arnold palmers. the honor system. old domino issues. room service. cobblestone streets. finding the perfect seashell. banana pudding. polaroid cameras. letterpress stationery. pumpkins in the fall. lemonade stands. the sailboats in conservatory water. old souls. starfish. wes anderson and woody allen films. plain white wedding cake. the velveteen rabbit. flea markets. slim aarons. "silly love songs" - paul mccartney. snail mail. sofia coppola. park avenue christmas trees. seaside, florida. mexican dresses. dirty martinis. the great gatsby dust jacket. galatoire's in the french quarter. lobster rolls. 84th & 2nd. WHAT IS LIFE IF YOU'RE NOT OBSESSED?